Laser Printer Drum vs Toner: What’s the Difference Between Them? You might be familiar with your laser printer’s toner cartridge, but do you know the difference between the printer drum vs toner? Find out from this guide. Sound like you? You’re not alone. Laser printers are on the rise. Every laser printer owner should know printer maintenance. One of the essentials? Learning the difference between drum vs toner. What is a printer drum unit, though? Read on for essential laser printer knowledge! Drum vs Toner Cartridge: What’s the Difference? Before we dive into the difference between these two laser printer essentials, let’s quickly go over how laser printers work in the first place. In short? They work based on electricity, with many different parts performing different functions. The machine picks up toner from the cartridge and moves it into the shape of the thing being printed. The computer tells the printer what to print, but in order for the toner to actually hit the page, it needs the drum unit. The drum unit is the piece of equipment that actually transfers the toner from the cartridge to the paper. The drum unit works by interpreting the computer’s instructions on what to print. It then picks up the toner selectively in order to drop it onto the paper in the right spots. It’s thanks to the drum unit that the right thing is printed on the page. This can get confusing, considering the fact that drum units and toner cartridges are often sold as one unit. How do you know which one to replace? And what’s better: keeping them separate, or buying them as one unit? You’ve likely seen these sold two ways: toner drum combo units, and as separate units that you replace independently of each other. Which is better? There are pros and cons in both camps. Replacing units separately is often more economical. One standard drum unit can print 12,000 pages, while toner cartridges can print anywhere between 1,500 and 5,000 pages. That means a drum unit’s life is at least two times that of a separate toner cartridge’s. Towards the end, though, quality may start to wane. It’s frustrating to work with a new toner cartridge and a dated drum unit. Replacing them together as a unit can eliminate that frustration for you. In our busy lives full of to-dos, the last thing we need to worry about is a sub-par printer and keeping up with our toner/drum unit schedules. Regardless of which you choose, your setup will work fine either way. The big things to weigh are cost and convenience. Once you work those priorities out, the choice will be easy! Now that you know the essential differences between drum vs toner, which one do you need for your laser printer? Either way, we’ve got you. And we’ve got something for you: every first-time customer receives a 10% cash back reward on their first purchase. 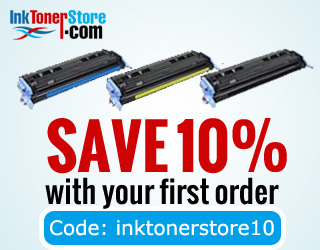 Create an account today, and use coupon code “INKTONERSTORE10” at checkout! Happy printing!